Barcrest presents this Irish-themed slot, which is played on two different sets of reels at the same time. One is a large 5x4 layout, and the other is an even larger set of five reels and twelve rows. There are a hundred paylines contained within the structure, with the basic RTP of the slot coming in at 96%. The slot contains two bonus features, one of which boosts the RTP up to 98%. The best play to play this slot is at Amigo Slots, where we also have hundreds more great slots like Starburst, Chilli Heat, the original Rainbow Riches and Fluffy Favourites. When Barcrest released the first-ever Rainbow Riches slot in 2009, they will have been aware that they'd created an excellent online slot. Even in their wildest dreams, though, they can't possibly have imagined that they'd started a franchise that would go on to spawn so many innovative sequels and almost redefine what players expect from a good Irish-themed online slot. That's precisely what they did, and that's how the release of 2016's Rainbow Riches: Reels of Gold came to happen. The Rainbow Riches series of slots operate on the same premise; they’re set in an especially bright and colorful Irish countryside, they’re packed full of rainbows, pots of gold, and leprechauns, and they come with multiple bonuses that make the slot exciting and fun to play. Where they differ is in their complexity. 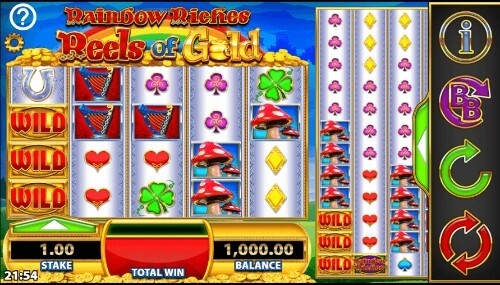 Some of the Rainbow Riches slots have been deliberately kept as simple and traditional as possible. Others have pushed the boundaries of slot game convention. Reels of Gold falls into the latter category. Gameplay in this slot happens on two separate sets of reels and rows at once. One of them is a 5x4 set, and the other is a gigantic 5x12. Try not to let that worry you; you're only responsible for spinning and monitoring the smaller set. The other one will take care of itself. There isn't much in the way of a background behind the colorful reels; they take up almost all the space available. There's still enough there to get a flavor of the scenic green fields of the Emerald Isle, but not much more. Irish stereotypes account for the majority of the symbols you'll see appearing on the reels. That means we have a horseshoe, a lucky clover, a harp, a toadstool, some rainbows, and a happy green leprechaun. The set of symbols is rounded out by comparatively lesser-values represented by playing card suits. The slot's logo serves as a wild symbol and will create winning lines by substituting for anything other than the scatter, which is represented by a balloon. It's worth noting that the symbols on the left-hand set of reels will frequently stack. When they fill up a reel by doing so, the stack will be copied onto the equivalent reel on the right-hand side. This is important because you're far more likely to find winning lines on the larger set of reels than you are on the smaller one. The bonuses in this slot range from the straightforward to the fairly complicated. We’ll deal with the simple one first, which is a Free Spins feature. You'll need to see a balloon appearing on the first, third and fifth reels to trigger the feature, but to boost your chances, they can show up on either set of reels (for example you could have one on the first set, and two on the other). The more symbols you have, the more selections you can make from the balloons that appear. Each balloon is hiding a number of free spins. When you've made your choices, you start the free spins round with as many free spins as you found behind the balloons. If you wish to (and providing your stake is a minimum of 50p) you can gamble to increase the number of free spins to anything up to a hundred, but beware the fact that you could also lose them completely! The next most simple bonus is Barcrest’s Big Bet feature, which appears in almost all the Rainbow Riches slots. By increasing your stake, you can up the RTP to 98% and receive five free spins with a series of conditions in place. The conditions are yours to choose from two options. You could have expanding wilds which fill the reels on the left and then transfer to the right. Alternatively (and for more money), you could have all bonus symbols found within the next five spins count towards the minimum three required to trigger the free spins, and have the expanding wilds active at the same time. Wild Burst butterflies which float gently onto your reels, and then turn every symbol they touch into a wild. Magic Wilds where completely stacked wilds appear on your reels by magic, (hence the name), and cause both sets of reels to be re-assessed for new wins. Reel Win Multiplier whereby any win is multiplied by a factor of two, three or five at the fairy’s whim. Magic Symbols feature means the fairy turns every low-value symbol on the reels into the same matching symbol. Guaranteed Win is exactly what it sounds like; the fairy simply shuffles your reels around to give you a guaranteed payout. Extra Balloon is also what it sounds like; whenever you have two balloons in view, the fairy may choose to add a third to trigger the free spins feature. We won’t pretend that this isn’t a very complicated slot game, and there may simply be too much going on for some players. If you’re up for a challenge and you like something a little different now and then, though, there’s a lot of joy to be had when the slot is going your way. Barcrest was once the best-known manufacturer of fruit machines and physical slot games in the whole of the UK and Europe. They were founded in 1968 and spent the next three decades dominating all of their rivals within the industry. Their cabinets could be found in casinos and bingo halls the length and breadth of the British Isles, and further abroad too. They were preparing to adapt to the internet age by the late 1990s, but their success had got them noticed in America. American gaming giant IGT acquired Barcrest in 1998. IGT wanted to expand their presence in Europe, and they saw Barcrest as the ideal brand to make that happen for them. They kept the Barcrest name alive, kept most of the staff and put them to work making online slots for the new era. It was during this time that the first ever Rainbow Riches was created. The success of that slot got them noticed by an even wider audience, and now Scientific Gaming wanted a piece of the action. They bought Barcrest from IGT in 2011. Scientific Gaming realized the same thing IGT did - the Barcrest name has inherent value to a British audience, and so it makes sense to carry on using it. That’s why you’ll still see Barcrest slots released to this day. Although they’re officially a sub-division of Scientific Gaming, you can find most of Barcrest’s staff grouped together in offices in Manchester, UK.